PIERRE, S.D. - Feb. 16 marked the 100-year anniversary of the discovery of the Verendrye (Ver-en-DREE) Plate near Fort Pierre. Eight documents relating to the history of the Verendrye Expedition and the Verendrye Plate discovery are available on the South Dakota Digital Archives. 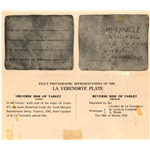 Of particular interest is the first brochure published on the Verendrye Plate, featuring photographs of the plate, titled “Photographs, Translations, and Brief History of the Celebrated La Verendrye Plate.” The digital archives also features firsthand accounts of the plate’s discovery and history of the Verendrye brothers expedition. Two French-Canadian brothers, Francois and Louis Joseph Verendrye, in trying to discover a route to "the Western Sea," planted the lead marker to claim the land for France on March 30, 1743 atop a gumbo bluff overlooking the Missouri River near present-day Fort Pierre. The importance of the Verendrye Plate is that it provides concrete evidence of the location of the Verendrye expedition and its journey through present day South Dakota. The Verendrye Plate is on display at the Cultural Heritage Center museum in Pierre. The photograph digitization project is funded by private donations and grants. If you are interested in sponsoring a photograph collection, please contact the South Dakota Historical Society Foundation at (605) 773-6001. Editor’s Note: Pictured is a page from one of the first pamphlets published on the discovery and history of the Verendrye Plate. 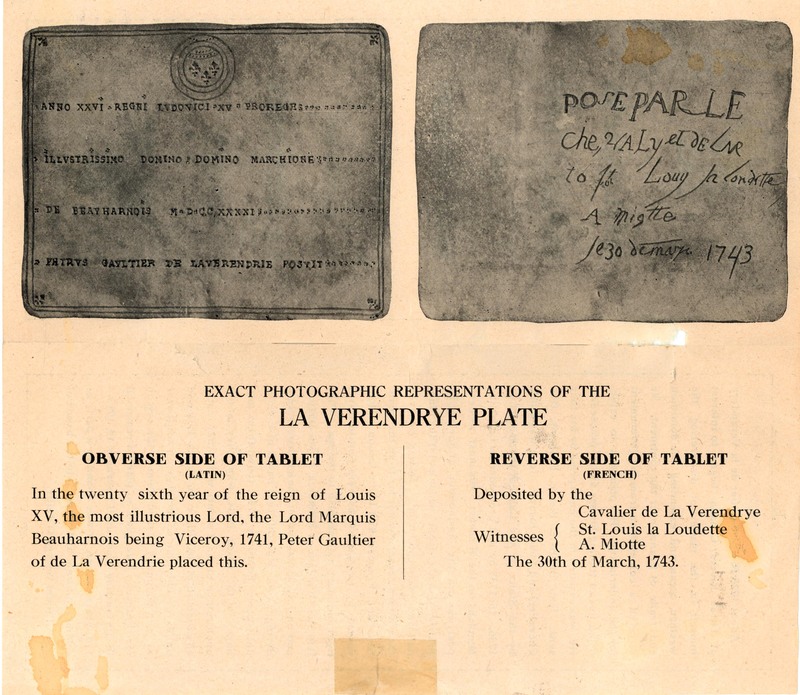 The pamphlet titled, “Photographs, Translations, and Brief History of the Celebrated La Verendrye Plate” is available via the South Dakota Digital Archives.